This hike links up two trails in Guadalupe Mountains National Park, Devils Hall and Tejas Trail, via some off-trail scrambling and then bushwhacking. Devils Hall is an easy-to-moderate 2-mile hike through a winding, narrow canyon with interesting rock formations and fall color. Coming down Tejas Trail is equally easy and offers great views down into the aforementioned canyon as well as views of peaks to the south and the valley to the east. The scrambling portion of the hike is fun boulder-hopping up a ravine. The steep mountain-side bushwhacking, though, requires a strong commitment to get up to Tejas Trail. Attempting to go back down to the ravine would be rather challenging due to the loose nature of the terrain and the thorny vegetation. The hike to Devils Hall begins at the Pine Springs trailhead adjacent to the RV area of the Pine Springs campground. It's an easy trail to follow with plenty of signage at each junction you encounter. The first mile is along a maintained trail up Pine Spring Canyon. The trail then drops down into the streambed where you'll encounter some light bouldering, an easy climb up the Hiker's Staircase, and, finally, the narrow Devil's Hall. The visuals, falls colors, and variety of terrain, we felt, were better here than in McKittrick Canyon. This would be a great hike for kids as they could climb over and around the boulders, each taking a slightly different route. After passing through Devil's Hall, continue past the sign that advises no further entry between March and August. Using our GPS route as a guide, take the un-named drainage the heads north up to the Tejas Trail and the Pine Top campsite. 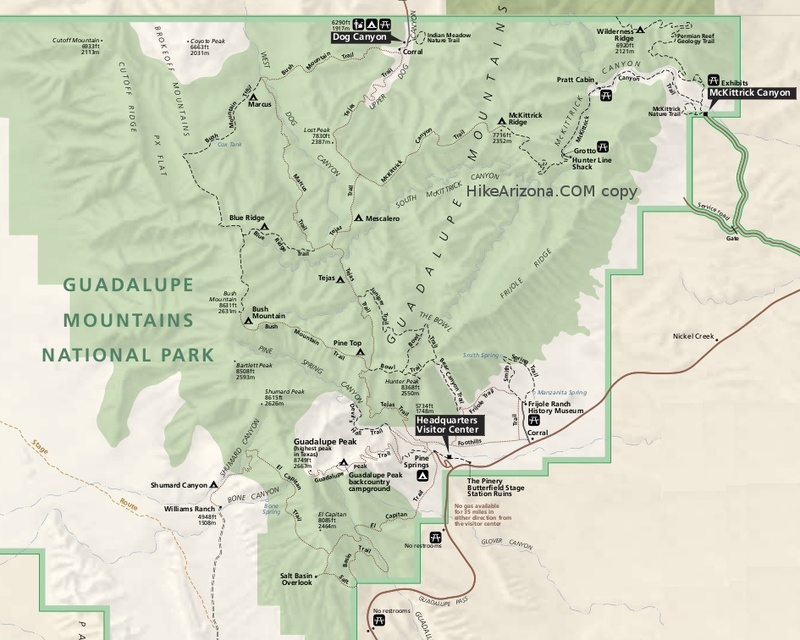 Looking at the National Geographic Trails Illustrated topo map for Guadalupe Mountains National Park, it's the drainage that is shown closest to, and north of, the end of the Devil's Hall trail. The boulder-hopping and scrambling up the ravine is more challenging than is found on the trail to Devil's Hall and has the added challenge of avoiding low-hanging branches and thorny sotol. But, no blood was shed during this part of the hike, so it wasn't too difficult. Eventually the ravine becomes heavily choked with shrubs and trees, so it's time to get on with the bushwhack up the mountainside on your right (headed east). Very quickly we came to the conclusion that we had to either commit to making it to the Tejas Trail or we turn around and retrace our steps back to the trailhead. The mountainside was covered in loose rock and cacti which would make a descent, well, nerve-wracking and, yes, bloody. We stayed on any game trails we could find, skirting around dense shrubs, avoiding thorns, even grabbing on to grasses to aid in the steep climb. Just about the time we started wondering if we'd ever come to the Tejas Trail, Hello!, there it was. We plopped down on some rocks and enjoyed our well-deserved lunch. Upon emerging from the bushwhacking, take a right (heading south) onto Tejas Trail. You'll see bits and pieces of the trail and streambed leading to Devil's Hall - a much different perspective as compared to being in the canyon! You can also see parts of the trail and switchbacks for the hike to Gualalupe Peak (Texas' highest mountain). After a short while the trail bends to the left and you're now offered a vista to the east and you can see the campground where you started. Tejas Trail is easy to follow with a gradual descent, though a large portion of the trail is narrow and on a steep slope. Pay attention to your footing. Near the end you'll be on level ground and, lastly, into the same streambed you hiked up to Devil's Hall. Cross the streambed by following the cairns and you'll arrive back at the Pine Springs trailhead. Note : We saw only one other person on either trails when we hiked this loop. Also note that we rated this loop a "3" for route-finding and a "2.5" for difficulty only for the scrambling and bushwhacking part of the hike. 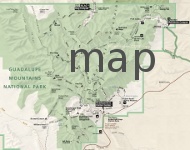 A GPS device, good map-reading skills, and experience with bushwhacking in a desert environment would be very useful.